I was a little bored yesterday, but when you’re not working on set — that’s what happens when visiting. In general it was kind of a reminder (as I watched the filming) of how much I love the process. It’s a happy set, that can be rare, here it’s all camaraderie and applause at the end of a take. I did observe shaking shoulders and suppressed laughter (my own included) while shooting, a good sign for a comedy. Okay, let’s talk about clothes! The director turns up every day in a suit and tie. Did I tell you how warm it is here? The expertly tailored suit is buttoned up, the tie is not loosened, the gentleman’s posture is perfect. I think this is a stroke of brilliance. At once he asserts his authority, his charming eccentricity (he carries a walking stick when he arrives), and you can spot him amongst the jeans and tees a mile away. He is a doll, and very, very, clever. I’m adjusting to a new climate (and my wildly swinging hormonal levels, ah perimenopause!) so everyday I down the java to chase away a migraine, today included. When the caffeine starts to take affect I will dive into writing, I think this place is going to be very good for finishing the next novel. I enclose this newspaper clipping as a reminder we all have scandalous pasts. What a beautiful figure! I would never know it is Bette. Sounds so intriguing…Trying to guess who the director is…. Well! That was something I’d never heard of before. Oh, Miss Vickie, you’re such a sleuth. 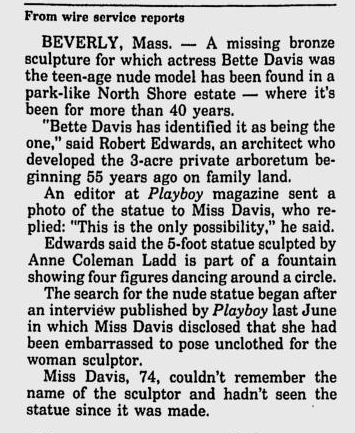 I just reposted this on the “BETTE DAVIS BABYLON” Facebook page where I know the lurkers there would be interested in learning about both this sculpture and, of course, your ever-fascinating blog. Amazing! But I can’t imagine she was embarrassed.